The James A. Farley Building is the main United States Postal Service building in New York City. It is located in Midtown Manhattan and was built along with the original Pennsylvania Station in 1912. The building is famous for bearing the United States Postal Service creed: "Neither snow nor rain nor heat nor gloom of night stays these couriers from the swift completion of their appointed rounds." The James A. Farley Building was formerly the General Post Office Building. The building was designated a New York City Landmark in 1966. It was officially renamed in 1982 as a monument and testament to the political career of the nation's 53rd Postmaster General James Farley. Since 2010, plans have been under way to integrate Moynihan Train Hall into the landmark as part of the Penn Station Expansion. The Farley Building consists of the old general post office building and its western annex. The Farley building is listed on the National Register of Historic Places and occupies two full city blocks, an 8-acre (32,000 m2) footprint straddling the tracks of the Northeast Corridor and the Farley Corridor (sub-district B) in western Midtown Manhattan. The building fronts on the west side of Eighth Avenue, across from Pennsylvania Station and Madison Square Garden. 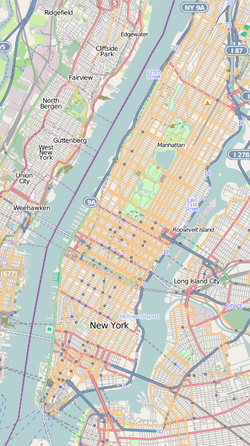 It is located at 421 Eighth Avenue, between 31st Street and 33rd Street in the New York City borough of Manhattan. The Farley Post Office once held the distinction of being the only Post Office in New York City open to the public 24 hours a day, seven days a week. However, because of the Great Recession in 2009, its windows started closing at 10:00 p.m. The monumental facade on Eighth Avenue was conceived as a Corinthian colonnade braced at the end by two pavilions. The imposing design was meant to match in strength the colonnade of Pennsylvania Station (also designed by McKim, Mead, and White), which originally faced the General Post Office Building from across Eighth Avenue. An unbroken flight of steps the full length of the colonnade provides access, for the main floor devoted to customer services is above a functional basement level that rises out of a dry moat giving light and air to workspaces below. Each of the square end pavilions is capped with a low saucer dome, expressed on the exterior as a low stepped pyramid. Inside, the visitor finds an unbroken vista down a long gallery that parallels the colonnaded front. The north end of the gallery houses a small Museum of Postal History. McKim, Mead, and White's range, which continues its Corinthian giant order as pilasters between the window bays, was simply repeated in order to carry the facade to Ninth Avenue. The original building was one of the last built under the Tarsney Act. Up until 1893, all federal non-military structures were designed by in-house government architects in the Office of the Supervising Architect in the United States Treasury Department. The 1893 act introduced by a Missouri Congressman permitted the Supervisory Architect to pick private architects following a competition. Supervisory architect James Knox Taylor picked McKim for the New York post office. In 1913, the act was repealed partially in light of a scandal in which Taylor had picked his former Minnesota partner Cass Gilbert to design the Alexander Hamilton U.S. Custom House. The building prominently bears the inscription: Neither snow nor rain nor heat nor gloom of night stays these couriers from the swift completion of their appointed rounds, which is frequently mistaken as the official motto of the United States Postal Service. It was actually supplied by William Mitchell Kendall of the firm of McKim, Mead & White, the architects who designed the Farley Building and the original Pennsylvania Station in the same Beaux-Arts style. The sentence is taken from Herodotus' Histories (Book 8, Ch. 98) and describes the faithful service of the Persian system of mounted postal messengers under Xerxes I of Persia. The U.S.P.S. does not actually have an official motto or creed, but nonetheless the inscription on the building is often cited as such. The ceiling of the front reception hall is decorated with carved national emblems or coats of arms of ten major nations at the time of the building's construction: the United States, the United Kingdom, the German Empire, the French Third Republic (represented by the cipher "R.F." for République Française since lacking an official national emblem), the Russian Empire, the Kingdom of Italy, the Kingdom of Spain, Belgium, Austria-Hungary, and the Netherlands. As part of Penn Station's construction in the 1900s, the Pennsylvania Railroad (PRR) proposed that the United States Postal Service construct a post office across from the station. on the west side of 8th Avenue. In February 1903, the U.S. government accepted the PRR's proposal and made plans to construct what would later become the Farley Post Office. A contract to build the Post Office was let in March 1911. The original monumental structure was built in 1912 and opened for postal business in 1914. The building's size was doubled in 1934 by then Postmaster General James A. Farley, who expanded the general Post Office to The Ninth Avenue side. The expansion replaced the City Hall Post Office at Park Row and Broadway, built 1869-80. Postmaster General Farley's historical association to the landmark is due to this expansion. Farley's building supply firm, the General Builders Supply Corporation, had received a federal contract under the Hoover Administration to provide building materials for the construction of the Post Office Annex. The General Builders Corporation supplied building materials toward the construction of such landmarks as the Empire State Building, Rockefeller Center, and the United Nations Headquarters. Farley was accused by then Senator Huey Long of Louisiana of receiving preferential treatment from the Roosevelt Administration, a charge that later proved to be false, as Farley would be cleared by the Senate of any wrongdoing in what would be known as "The Long-Farley Affair of 1935". Upon opening in 1914, it was named the Pennsylvania Terminal. In July 1918, the building was renamed the General Post Office Building. The building was designated a New York City Landmark in 1966. In 1982, the Penn Station post office was dedicated as the James A. Farley Building. (97th Congress, H.Res. 368 3/2/1982). James Farley was the nation's 53rd Postmaster General and served from 1933 to 1940. He was also the supreme Democratic Party boss of New York State at the time, was responsible for Franklin D. Roosevelt's rise to the Presidency, and is the first Roman Catholic politician in American history to have crossover appeal as a candidate for the office of the Presidency of the United States of America. Farley, a native New Yorker, was instrumental in the political careers of Alfred E. Smith and Franklin D. Roosevelt, having served as campaign manager to both. Farley was a Democratic candidate for U.S. president in the 1940 United States presidential election, running against Roosevelt in the primary. The Farley Building was instrumental to maintaining service levels in the New York City area following the September 11 attacks, when it served as a backup to operations for the Church Street Station Post Office located across the street from the World Trade Center complex. Advances in automated mail processing technology, coupled with adjustments to postal distribution and transportation networks, now make it feasible for the Morgan Center to handle high volumes of mail. Portions of the landmark James Farley Post Office are being adaptively reused and converted to house a new concourse for Amtrak. The Amtrak facility within the historic Farley Post Office will be named the Moynihan Train Hall. A first phase, consisting of new exits and a mezzanine within the James Farley Post Office, broke ground on October 18, 2010. A second phase, comprising a new train hall within the Farley Building, started construction in August 2017. Beyond retail lobby services, other postal operations that would remain in the building will include Express Mail, mail delivery, truck platforms, and a stamp depository. Administrative offices for the Postal Service's New York District will also be headquartered within Farley, and Operation Santa Claus will remain at the landmark post office. The Farley Building is home to "Operation Santa", made famous in the classic film Miracle on 34th Street (1947). The building is the inspiration for the post office in Terry Pratchett's novel Going Postal (2004), with its "Glom of nit" legend. It is also depicted three-dimensionally and serves as a main home base for the fictional Catastrophic Emergency Response Agency (CERA) in the 2016-released video game Tom Clancy's The Division. ^ a b Tangel, Andrew; West, Melanie Grayce (January 8, 2016). "New Name for Revamped Penn Station Surprises Moynihan Officials, Sparks Debate". WSJ. Retrieved March 6, 2019. ^ Molnar, Phil; Burke, Kerry (April 16, 2009). "James A. Farley Post Office to close 24-hour window". Daily News. New York. Retrieved 2011-08-07. ^ DAnna, Eddie (April 17, 2009). "New York City's main post office stops 24-hour service". Staten Island Advance. Retrieved 2009-05-05. ^ Lee, Antoinette J. (April 20, 2000). Architects to the Nation: The Rise and Decline of the Supervising Architect's Office. USA: Oxford University Press. ISBN 978-0-19-512822-2. ^ "POST OFFICE SITES SELECTED BY COMMISSION. ; Offers of the Pennsylvania and New York Central Railroad Companies -- $2,000,000 Needed". The New York Times. 1903-02-25. ISSN 0362-4331. Retrieved 2018-05-22. ^ "ALL READY FOR WORK ON NEW POST OFFICE; Contract Let to George A. Fuller Company and Building to be Done in 23 Months". The New York Times. 1911-03-11. ISSN 0362-4331. Retrieved 2018-05-24. ^ "POSTMASTER'S NEW OFFICE. ; Executive Department Will Move to Thirty-first St. and Eighth Av". The New York Times. 1914-09-02. ISSN 0362-4331. Retrieved 2018-05-24. ^ "THE CONGRESS: Political Feud". Time. February 25, 1935. Retrieved 2010-05-05. ^ Jones, Terry L. (23 August 1987). "An Administration under Fire: The Long-Farley Affair of 1935". Louisiana History: The Journal of the Louisiana Historical Association. 28 (1): 5–17. doi:10.2307/4232557 (inactive 2018-09-11). JSTOR 4232557. ^ "The Nation: Farley Wins". Time. August 31, 1942. Retrieved October 25, 2008. ^ Hardt, Bob (January 7, 2016). 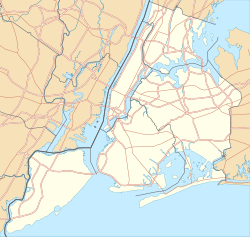 "NY1 ItCH: Let's Not Rename Moynihan Station". Spectrum News NY1 | New York City. Retrieved March 6, 2019. ^ "New York Penn Station expansion to finally see light of day". Trains. October 18, 2010. Retrieved October 20, 2010. ^ "Work to begin on massive Penn Station expansion". Long Island Business News. Associated Press. May 9, 2012. Retrieved May 9, 2012. ^ "3 contractors picked for Penn Station overhaul". Associated Press. September 27, 2016. Retrieved September 28, 2016. ^ Nasa, Rahima; Blain, Glenn (August 17, 2017). "Cuomo touts $1.6B train hall project next to Penn Station". NY Daily News. Retrieved September 6, 2017. 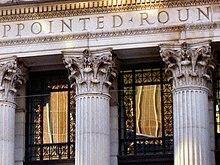 Wikimedia Commons has media related to James Farley Post Office. Rep Garcia, Robert (Sponsor). "Bill Summary & Status 97th Congress (1981 - 1982) H.RES.368: Bill designating General Post Office the "James A. Farley Building" (A resolution calling upon the United States Postal Service to designate the General Post Office Building, New York City, as the "James A. Farley Building")". Thomas.loc.gov. "Exploring The (Nearly!) Empty Post Office Building On 8th Ave (Extensive pictures of the James Farley Post Office Building's interior)". Scouting New York. January 1, 2011. "Postal History: James A. Farley Biography" (PDF). USPS. Archived from the original (PDF) on 2007-08-10. "Weekly review of USPS: James A Farley Station". Yelp.com. New York City. This page was last edited on 7 March 2019, at 19:37 (UTC).